Friday May 23rd 1890 It had stopped raining this morning. Fanny helped me with the work and then Lee took her back to town she is going to Burlington this afternoon. Marys girls came along to go to town in the afternoon and Tishie stopped here when they came back. we all went over to Marys to spend the evening. I wrote to Mother this afternoon. I am working on the fly net for Nellie. The boys put in a new platform at the north cistern. Saturday May 24th 1890 Us girls cleaned up the house and done our baking before noon and in the afternoon went out to Marys for a visit. Winnie was in town. I done a little sewing in the evening after our work was done. Will was in town. 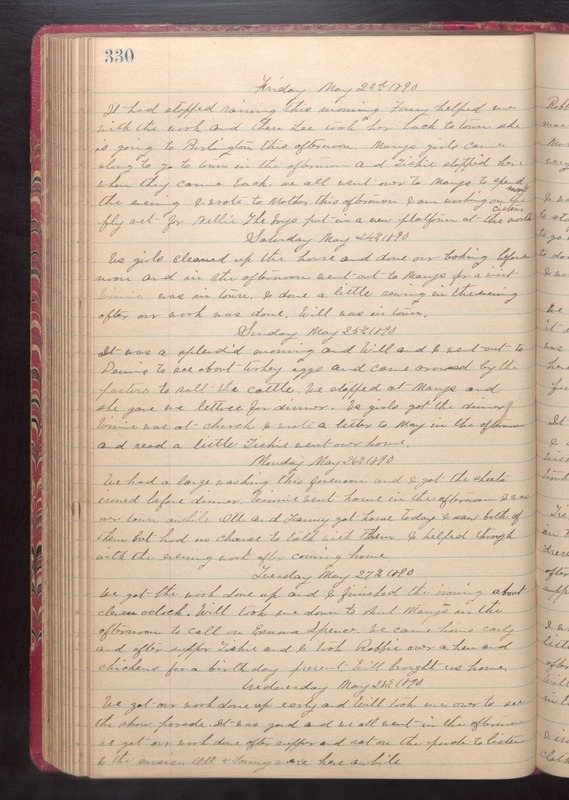 Sunday May 25th 1890 It was a splendid morning and Will and I went out to Dennis to see about turkey eggs and came around by the pasture to salt the cattle. We stopped at Marys and she gave me lettuce for dinner. Us girls got the dinner Winnie was at church. I wrote a letter to May in the afternoon and read a little Tishie went over home. Monday May 26th 1890 We had a large washing this forenoon and I got the sheets ironed before dinner. Winnie went home in the afternoon. I was over town awhile. Ott and Fanny got home today. I saw both of them but had no chance to talk with them. I helped through with the evening work after coming home. Tuesday May 27th 1890 We got the work done up and I finished the ironing about eleven oclock. Will took me down to Aunt Marys in the afternoon to call on Emma Spencer. We came home early and after supper Tishie and I took Robbie over a hen and chickens for a birthday present. Will brought us home. Wednesday May 28th 1890 We got our work done up early and Will took me over to see the show parade. It was good and we all went in the afternoon. We got our work done after supper and sat on the porch to listen to the music. Ott & Fanny were here awhile.